Metadata is information about an object (like a post) and consists of a key and a value. For instance, when you use a page template, the name of the template used by the page is stored as metadata using the key _wp_page_template. You can add your own metadata to store anything you’d like. This article focuses on post meta, which is metadata attached to a post of any content type (post, page, or custom post type). There is also user meta (attached to users) and term meta (attached to taxonomy terms, like categories and tags). A metabox is simply a box that lets you edit metadata. 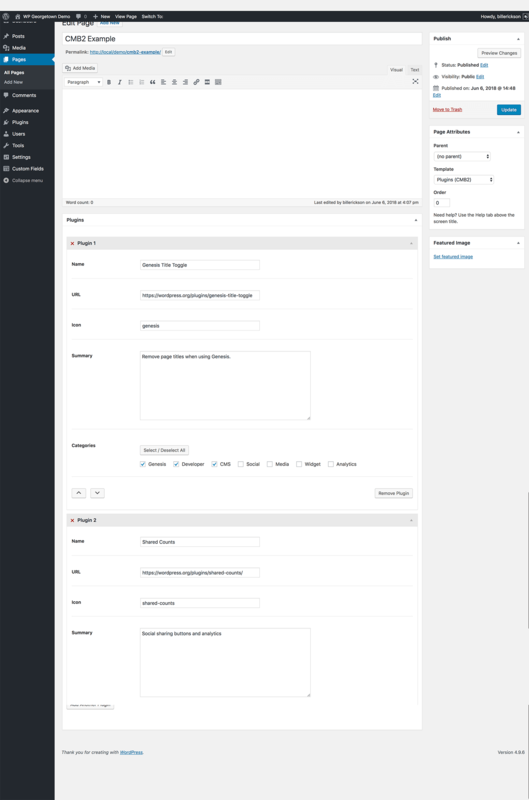 While WordPress already includes a simple “Custom Fields” metabox (screenshot), it’s best to build your own metabox, which will look better and be easier to use. A common use for metaboxes is to store structured data that is then displayed by the theme. This allows you to separate the data entry from visual presentation. Instead of trying to get the markup just right on a pricing table, create a “Pricing Table” metabox to collect the fields and let the theme take care of the markup. How to use meta in your theme? WordPress has a simple function for accessing post meta: get_post_meta( $post_id, $key, true );. See the WordPress Code Reference for more information on its usage. Depending on the plugin you use and the complexity of the fields you build, you may choose to use plugin-specific functions to access metadata. For instance, with Carbon Fields you can use carbon_get_post_meta( $post_id, $key );. Always first check that the function exists( if( function_exists( 'carbon_get_post_meta' ) ) ) so your site doesn’t break if the plugin is deactivated. The simplest way to create a metabox is to use a “metabox plugin” to do the heavy lifting. You describe the fields you want and the plugin takes care of actually building the metabox and saving the data. I’ll walk you through building the metabox for this page using three popular metabox plugins. Advanced Custom Fields is the most popular plugin for creating metaboxes. You can easily build a metabox from the WordPress backend with no code at all. You can use the Local JSON feature to save your metabox settings in your theme so it can be version controlled. While the free version of the plugin includes many basic field types, this tutorial uses the “Repeater” field which is only available in ACF Pro. In the backend of your site, go to Custom Fields > Field Groups and click “Add New”. Give your metabox a name at the top, then click “Add Field” to add your fields. Here is a list of the available field types. I’m adding a repeater field, and inside of that I’m adding some text, textarea, and checkbox fields. I’m also setting the “width” on the first 3 fields to 33% so they appear in three columns. In the “Location” section you can set rules that determine where this metabox appears. I’m limiting this metabox to appear on pages using the “Plugins (ACF)” template. 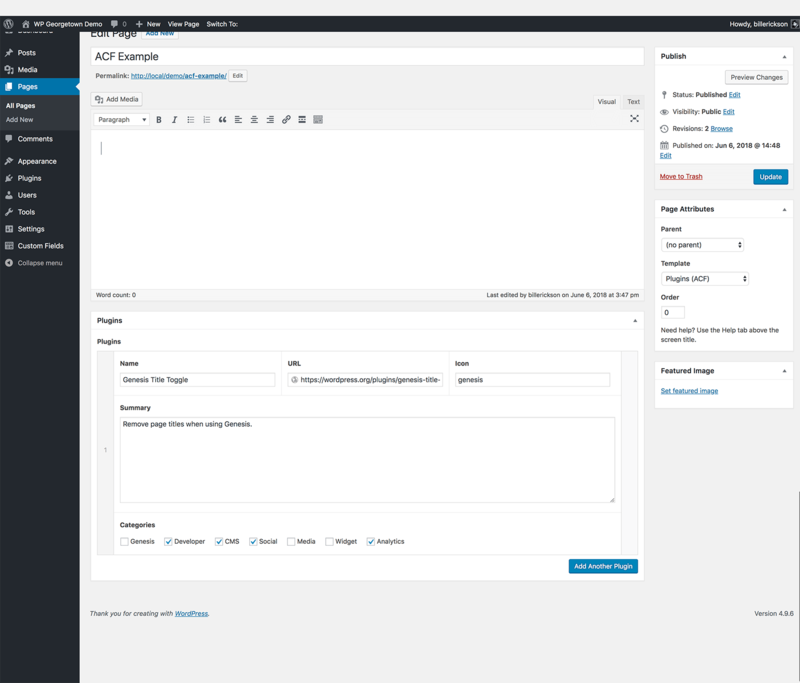 To access the data in your theme, you can either use the WordPress core function get_post_meta() or the ACF functions. I’m using the ACF functions in the template file below. Here’s the raw metadata stored in the database. Carbon Fields is another great metabox tool. You build metaboxes using code rather than a UI like AC. The code is modern and easy to read, and the resulting metaboxes look great. It takes the best from both ACF and CMB2 and improves upon it. They are also working on a block builder for the new block editor. Installing the plugin is more difficult than the others. While there is a Carbon Fields plugin in the WordPress plugin repository, it’s not up-to-date. They made non-backwards-compatible changes and decided not to update the plugin repo. You can either use Composer or download the plugin here. 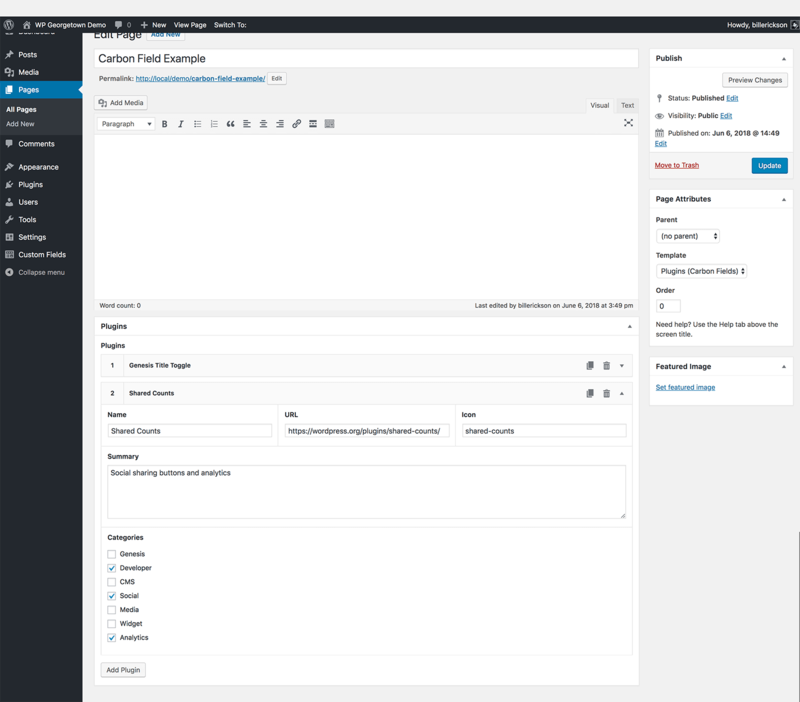 Once installed and active, create carbon-fields.php file in your core functionality plugin (preferred) or theme. See the documentation for more information on how to build a metabox. I have it set to ->set_collapsed( true ) so when you load the page you only see the small header bars (like “Genesis Title Toggle” below), but in this screenshot I’ve expanded the second entry. I’m using the plugin functions for accessing the metadata. In case you’re curious, here’s the raw metadata that’s saved to the database. It isn’t as easy to follow as ACF or CMB2 so I definitely recommend using the plugin functions. While it is all stored as separate meta, on “complex” fields carbon_get_post_meta() will return a single array containing all the data. CMB2 is the most developer focused of these three plugins. It’s infinitely extensible and often used in large projects since every aspect can be customized, including custom styles for the metabox. But it can be a bit difficult to learn and doesn’t look as good out of the box as the other plugins I’ve covered. You can either use the WordPress plugin (as I have done) or include the CMB2 code directly in your theme/plugin. It’s smart enough to only load once when multiple copies are enqueued, and always select the most recent version. I recommend you review the documentation on Basic Usage, Field Types, Field Parameters, and Display Options. * Define the metabox and field configurations. CMB2 uses the standard WordPress function get_post_meta() for retrieving meta, so there are no plugin-specific functions you need to learn. My intention is to use this on a Genesis Child theme, but I think I’m missing a step. First of all, I was being dense and didn’t create a proper function for this in my functions.php file…der! Second, your test sent me in the right direction as I did get the Rotator function to show in my post editor. Thanks for your guidance, and to all of you for the cool code! One follow up if I may. Would I need to create a separate register post type function in order to show these meta boxes on only that post type? Then simply change the post type above? Or do I need to create the custom post type within the above function? In my “genesis-child” theme (the base theme I build everything from), I have one function that registers post types, one for taxonomies, and one for meta boxes ( this one). So you would just need to register the post type somewhere (not necessarily in this function) and then the pages(‘post-type’) will work. Since I posted the above I researched some CPT tutorials and copy/pasted the CPT code. It didn’t work. While testing, I copied in a duplicate CPT and renamed the variables. Then my new one showed up, but not the original example. After some further finagling I’m convinced something strange is happening, it’s probably so simple I’m missing it, but I can duplicate this behavior consistently…. …I have two CPTs registered in functions.php. Both are exactly the same except that I have changed the names of the labels. Only the second one listed in functions.php shows in my admin menu. When I remove the one on top, then the CPT disappears from my admin area. When I put it back, again, only the second CPT registered shows up in admin. If I switch the two around…again, whatever CPT is lowest in my functions.php is registered and showing. I have looked for any differences and I don’t see any! I know this is beyond the scope of your post here, so feel free to ignore my ranting here, but if you have any thoughts of what would cause such a thing, I’m all ears. I dropped that code in my functions.php file and it worked just fine – both post types showed up. Maybe it’s an issue with some other code in your functions file? Plugin conflict. Premise from CopyBlogger Media. It creates CPTs (custom landing pages)…going to submit bug report now. Looks like it was a menu position conflict. I added the menu_position argument to my CPT and all are visible now. I think this is great and I love the way it works! One question that I haven’t been able to find and answer for, and I apologize for my lack of know-how, but how to I call this information to get it to show up on a post page? I am able to customize the functions and it all shows up on the back end as I planned. I just can’t figure out how to get my “project_text” or anything else to show up on a page. Can you provide me with a sample php to call this info? I had located something very similar before you responded, so I wasn’t that far of, However even with your suggested php I still have not been able to get this to work. I even tried it on the “twentyten” theme and have had absolutely no luck at getting anything to show up. I can add and remove all day from the admin/editor by modifying the functions, I just can’t get that data to populate to the live post page. Am I missing something. Do I need to register something else in the functions? What you have created is so clean and awesome, I’d love to be able to use it but I don’t see how. Thank You! – You’re forgetting to put global $post; before using $post->ID in the get_post_meta() function. – There’s an issue with your metabox that prevents the data from saving. You’d know if this was happening though, because after you click “Save” you wouldn’t see the post. putting the_meta() in the loop is what did it for me. This opens up a whole nother can of worms to work with. I appreciate the shove in the right direction! One other thing that was throwing me off was the prefix included in the functions you provide. So in my code ‘project_text’ has to be ‘cmb_project_text’ as well as any other instances using the custom meta boxes. I assume there is a rhyme or reason, but are the prefixes actually needed? It would seem easier/shorter without. Again, please forgive my lack of knowledge just wanted to post my additional findings in attempt to help others. Thanks! @ Charlie, it’s a recommended coding practice in WordPress to prefix everything. If you install a plugin or theme that uses the custom field “project_text” you could have some bad interactions. By creating your own prefix you minimize the chances of using the same field name (what’s the chance someone created a field called be_project_text or crm_project_text). First of all thank you for this great plugin/code. I just installed it on one of my themes and it works great. I created a field (‘type’ => ‘textarea’) and I need to add some HTML code in the textarea and I need the html code to do something in the front end. However, the code gets displayed in text-format. I need this to be displayed as an unordered list in the front-end. But what I get is the code displayed in text-format. I know I have the option of changing the field type to ‘wysiwyg’, but I need to create several custom fields in “page” view and I would prefer if they were ‘textarea’ instead of ‘wysiwyg’. Please let me know if this is possible and if yes, how would I go about doing it. I’ve been using your code and it’s working great. Thank you very much. How would I check for the value? Depending on the value, I’m going to either show something or not. But I’m not sure how to check for the value of a radio button. Instead of using a radio with Yes or No, I’d rather use a checkbox. Then you could just check to see if the custom field has a value. Also, thanks for the “checkbox” suggestion, that makes more sense. Just curious, I’ve been really enjoying the Custom Meta Boxes, but noticed that the ‘wysiwyg’ option is a little more limiting than the WordPress default where you can insert an image within the text and/or toggle the HTML view. I understand why you would do this, but is there a meta box option that could would include these like the wordpress? I don’t think it’s possible to duplicate the WordPress post editor with the media library. Even if you could add the media library to the alternate WYSIWYG, it would require some serious customizations to the media library to make the image not automatically inserted into the main post editor instead of your alternate one. If you need the full WordPress editor I’d recommend finding a way to use just the post editor instead of an additional WYSIWYG. For instance, if you’re trying to do multiple content columns, use a content filter or shortcode. thanks so much for this! I love how elegantly it works. I have a question though. I’ve created two custom fields, one for first name & one for last name. I’ve also hidden the post title from the editor. Now I would like to combine the first name & last name fields to give me the post title, such that it would replace WP’s post title field. (Right now, the way I have it set with the post title field hidden in the editor, I am getting ‘Auto Draft’ in the listings in the admin.) I think I need to set up another field that combines both the first name & last name but I’m unsure how that would be set up in the function with the arrays or how it would insert into the Post Title field. Does that make sense? Thanks again! I’m still not sure how to implement it within the array. I really appreciate your help and the custom metaboxes!! In my create metaboxes action I have a prefix of “sq_” – does that need to be included in the above script? Also where does this add_filter go? Does it need to be nested with my create_metaboxes or create_my_post_types? I’m sorry, I don’t have any experience editing the title on save so I can’t help. But why edit it there? Allow the user to construct the title however they want and then on the frontend add the vehicle year and color before displaying the title. I have another question regarding the image file upload field. I don’t know if I’m doing something wrong but it doesn’t seem to be working. I’ve got the other fields set up correctly and are being entered and saved properly. I didn’t do anything but copy and paste the code from example-functions file. The field itself is showing up in the editor; the issue is that when I click on ‘Upload File’ button, nothing happens. Am I missing something? I’m working off my localhost so I don’t know if that has something to do with it. Trish did you mail Jared about the file upload function? Bill, do you know if this function is working yet? I’m out of the country so haven’t been keeping up with the CMB development, but my understanding is that it isn’t working at the moment. What I would use is the default media uploader, then once uploaded copy the image url and paste it in a text field. If you name your theme like “My Theme”, it is not posible to access the jquery.cmbScripts.js file and you will get a 403 message. Name your theme always without spaces, remove the space or use underscore: “MyTheme” or “My_Theme”, because it’s space sensitive! Did you ever find a solution to the image file upload field? I have the exact same issue. I too am running on localhost (XAMPP). I have discovered in Firebug that there is a 403 access error on the file – jquery.cmbScripts.js?ver=3.1.3. what if I want one set of fields for a CPT, and another set of fields for pages? Anyway, I need to have multiple uploads, and it looks like the are being stored as a two dimensional array in the meta fields so it should be possible, but I am not sure how to get it to work in the front-end. is there something that is intuitive that I am missing? The way I am doing it is uploading the file first using the upload box, coping the url, pasting it in the box again, and then it is there below with links to remove, etc. If I try to duplicate the steps again, it appears to replace the first one with the current. By the way, I am going to post this on Bill’s blog as well, in case you see it there first. I found the answer to the earlier post I had, the example file did not mention the file-list type, I see that in the source and it will do what I need. Thanks for a great product! But I can not get it to display on the front page. What doesn’t work? Are you able to access it with get_post_meta($post->ID, ‘bt_g_image’, true); ? Also, your add_action references bullet_create_metaboxes, but the function is called create_metaboxes. Nothing appears on the post page. Nothing shows on the post page. No matter what I try. Try putting global $post; right before you do the get_post_meta. You an also try running the function the_meta(), which should output all post metadata. If it doesn’t show up there that means it’s not actually getting saved to the post. Nothing. Apparently there is another issue. Any ideas? Hi Bill I found the error. I was trying to use this with a registered post type. I gt it to work on a regular post. What do I need to do to make this work with a ‘register_post_type’? I know I need to change the ‘pages’ field to the ‘register_post_type’ name, but something tells me I need to also change something in the init,php file. Is that correct? That is exactly what I did and it did not work on the post made within that post type, but if I change it back to post it works on the normal post type outputs. thanks for this very helpfull class. I have a custom post-type ‘books’ for which I have a custom class ‘BookClass’. If I declare the meta in the theme functions.php everthing is fine. If I try to init the meta out of my class it is not showing up in the admin-panel of my custom post-type. Is it possible to call it out of a custom class? Is there something particular to keep an eye on? Sorry for this (maybe) stupid question… I just started to work with wordpress. I’m sorry, but I don’t really understand the question. Could you rephrase it? What do you mean by “custom class” and “init the meta out of my class”? I crated a php-class for my custom-post-type ( ), which is included in to my functions.php. So my thougt was, that the custom metaboxes belong to the class, so they should be created within the class, not in the functions.php. I’m not familiar enough with PHP Classes to know the best way to do it. It sounds like a good idea to put it in there, but you’ll still need to have a metabox function that runs on init. Seems that the “add_action( ‘admin_menu’, array(&$this, ‘add’) );” in “class cmb_Meta_Box” is not called if I try to create the MetaBox in my custom Class. The cunstructor of “class cmb_Meta_Box” is called. Anyway, thanks a lot for your help. I think I can live with it in the functions.php. how to add a default value? I installed this on with my custom_functions.php file in thesis. I’ve added the example meta boxes in my functions file but they aren’t appearing in the custom post type I created (and I changed line 8 above to the custom post type). oops, nevermind. Placed the require_once() in the wrong place… oh, jeez! It looks as though this doesn’t work for WordPress 3.2. I just updated and it was working before, not after. It’s working for me on 3.2. If you are having issues try downloading the most recent version. Jared pushed out an update yesterday. Thanks for the update. That seemed to fix whatever was going on. but nothing appears. I figured it would be similar to any post meta value, but perhaps I’m over looking something obvious. Nevermind, figured it out. Sorry to crowd your comments with silly requests! Moving to fast and overlooking the little things! Thanks for the great code, this is really helpful! One thing I cannot seem to get working is saving the values of checkboxes and/or radio buttons. They show in the backend, but when I tick a box or select a radio button and click Update, it comes back empty. Am I forgetting something? Thanks for your reply Bill, it was my own silly mistake, got it working too now and it does a tremendous job! Thanks! I have one last question. Before I was using your class, I used another, similar metabox class by deluxeblogtips (http://senl.in/q2zpAV). That was all working fine until WP 3.1.4. Upon the release of WP 3.2 the script broke the wysiwyg editor, so I needed to find an alternative. I am therefore very happy that I found your script (recommended by a friend). One of the features the other script had though was the ability to upload multiple images. I have seen that your script also has an image upload field, but I am wondering whether that also works for multiple images and whether it will be possible to sort those images after upload. If it is possible, then that’s great of course. If not, then it might be an idea to try to implement that functionality in your script too? I believe the image upload type only allows one image, which is the most common use case. If you want multiple images uploaded I recommend turning on the editor and using the Media Uploader, or just adding to the media uploader to the post type. That way you can use the gallery feature. OK thanks, will try out the various options then. OK sorry to fill your comment line, it must be a bug somewhere in my theme or one of the plugins I use. Just tried it on a vanilla local install and there the editor actually does show up. our replies crossed… i will post on github for this issue then! thanks! Hi Bill. I’m very inexperienced with WordPress and PHP but your metabox code, and this article, has made the creation/implementation of Custom Meta Boxes super easy, so thank you! I’ve implemented CMBs for a custom-post-type but have since been mulling over other ways to use them and wondered if it’s possible to show CMBs on a specific page only? I hoped that ‘pages’ => array(‘page_name’) would work but it does not. Unfortunately no, you can’t display it on a specific page. But you could use CSS to hide the metabox on all pages except the one you want it on. It’s beyond the scope of this post, so search around for Admin CSS. Ah-ha, thanks for the tip! I’ll have a search round. Just thought I would follow this up in case any one else is interested. Kevin Learyhas a useful article that basically walks you through exactly what’s needed. @Alex I’ve added page-specific code to the metabox script for a few client projects and do want to add it to the core. But I have another feature that’s more important and will most likely result in a complete rewrite, which is why I’ve held off. I want to rebuild it so you can easily add new field types without editing the core (you add the code either to your theme or plugin). It would be done with a filter or hook, and then all the default field types will also be added through that means. Once I have this built it should be pretty easy to add page-specific filtering of the metabox. Thanks for the great code Bill, just a small question left. I managed to create one box with multiple fields in them. Is it possible to create multiple boxes (for example one on the left and one right) and how? Thanks again! Yes, you can create multiple boxes, just duplicate the code you used to create the first box and change its title and id. But each one will be a full metabox – you won’t be able to float them next to each other (except with additional CSS). I have had some problems with the file-upload function, specifically using a custom post type where I have disabled the default wordpress wysiwyg box. In this instance, the thickbox with the file upload dialogue opens WAY off page – lower-left corner, about 300px below the footer. It works fine in another CPT where I have enabled the default wysiwyg. I’m wondering if this is a known bug, and if there is a way to fix it. I am going to enable the default WYSIWYG for the CPT for the time being, but it would be ideal if I could still use file upload without using the default WYSIWYG. If it’s not on there, please create a ticket. But none of us have been that successful with fixing WYSIWYG issues. Would it be possible to use a metabox to add a URL and then when the page is called via a link within the site, page launches a new window and displays the URL in the metabox? Almost like a 301 redirect, but in a new window. Yes, the metabox could collect the URL, but I don’t know what technique you’d use to automatically open a page in a new window without it being blocked by most browsers. If I use the wp_redirect(), can I add the target=”_blank” in the command? Is there a way to add the target? Not to my knowledge. wp_redirect() always opens in the same window. If you change the priority of your metabox to high (from low in the example below) it should show up above the Genesis metaboxes. You could remove the function that adds the metaboxes and duplicate it in your child theme using the “low” priority, this isn’t future compatible. If Genesis comes out with new/updated/removed metaboxes, your code won’t reflect that. Hi Bill, awesome script! One problem I’m running into though. The “Add Image” or “Add Gallery” features in the WYSIWYG editor are not working correctly. I can upload and do all that jazz, but as soon as I try to “insert into post” I get a “Too much recursion” error in the console in Firebug and the image editor lightbox goes blank. It looks like there is something wacky going on in the jquery.cmbScripts.js file on line 81 “window.original_send_to_editor(html);” I’m having some trouble getting this to work. Any ideas? Excellent script and nice to you responding to issues, however preliminary or elaborate, well after its release. Thanks for the great script Bill. I can’t get shortcodes to work in WYSIWYG, they do if I use in WP text editor but not in additional editors. Is that something I do wrong or it’s not really possible ? Shortcodes are only executed on the post editor because there’s a filter that runs on it. For anything else (like your custom fields) you’ll need to wrap it in do_shortcode( ). Let’s say you created a custom field called “be_extra_content” and wanted shortcodes to be executed on it. excellent, it worked. Thank you very much! I need to store loads of events as custom post types, planning on using the date picker. Any way within your guys’ code to format the date to timestamp (i.e. 20110916) rather than 09/16/2011? How would you approach this using your custom metaboxes lib? Perfect! Many, many thanks, Bill! How to add default radio checked? I have same problem to deal with multi checkbox default value as well. Here’s an out there implementation question. I’m trying to use a bit of custom code that someone wrote to make a call to Google Maps API based on a custom address field. It parses returned XML to a lat/long pair and writes it to appropriate custom fields. This code uses “publish_post” while your code uses “save_post” to update custom field values and the lat/long fields never update with the returned values. Any thoughts on how I can get the two to peacefully co-exist? You’ll probably need to modify one or the other. As shown here, publish_post runs before save_post. Maybe you could try changing the custom code to use ‘save_post’ and a later priority (like 15). That seems to have worked. I was trying save_post and publish_post yesterday, but I wasn’t playing with priorities. I set the Google code to run with save_post with a priority of 15 and it populates the fields now. but the metabox does not display on the custom post type’s creation page. I’ve tried adding global $post before $prefix and that did nothing. I’m at a loss. Any thoughts? Thanks. I’m testing this on 3.3 alpha in a Genesis child theme. The code that I had posted here on this page was out of date. The metabox code now uses a filter. See the updated code above, or refer to the example-functions.php file in github. Thanks. I had downloaded from github on the 7th, but the updated code works like a charm. It sounds like the easiest method would be to use the Custom Fields functionality in WordPress. It lets you add as many fields as you want. When creating a metabox you have to define them all upfront in code – the client can’t add new ones on specific pages. Is there anyway, I can have different types of meta boxes for each page. Can i have different meta boxes for Home and different meta boxes for Contact and About, even though the post type for all three is array(‘page’) ? Currently you can include based on page ID. 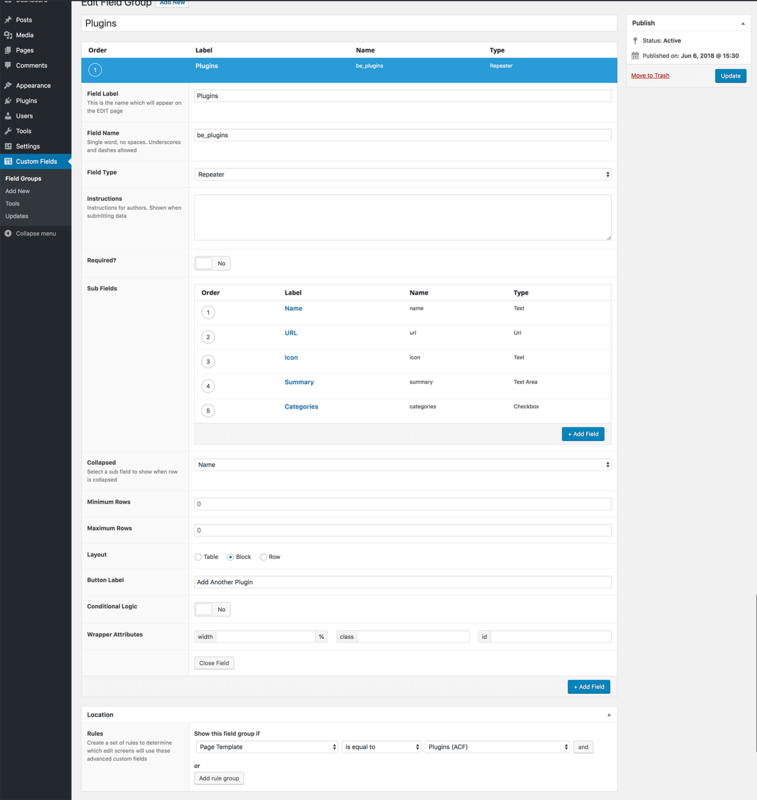 In trunk (the version under construction), you can also include based on page template. I’m hoping to add a filter in here so you can define your own inclusion/exclusion methods, like excluding based on ID. You can now define your own show_on filters. I’ve even written your specific show_on filter as an example. So download a copy of trunk and give it agao. Another quick question: When using field type file, is there currently any way to retrieve the attachment ID rather than the full URL to the inserted image? I’d like to use image presets via add_image_size. Thanks! I’m learning a ton. When I start putting this to use in client themes I’m sure I”ll run into hiccups. Do you recommend a place to go to for help? Is something like this beyond the support offered at StudioPress? Thanks for this useful tutorial. Your code worked great for my genesis project .But now i am using nova theme from Elegant themes.I followed the same steps as I did for genesis but I am getting this error .Please help me out.Thanks in advance. Are you sure you’re calling it from the theme’s function.php file and not WordPress core’s? It’s saying apply_filters() is undefined, and the only way that can happen is if you drop your code in somewhere before WordPress has fully loaded.